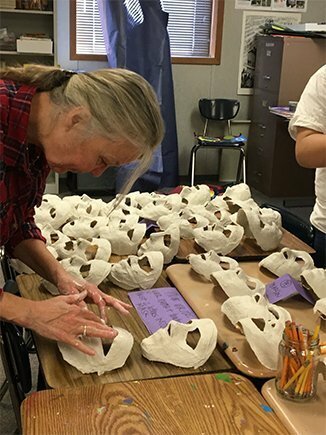 Follow along as the fifth graders at Moss Elementary School in Granite School District make plaster casts of their own faces. Kirsten Schiel, BTSALP Visual Art Specialist at Moss demonstrates to parents, community volunteers, and University of Utah student helpers, the steps of mask making. After donning a paint shirt, (This process gets MESSY!) Vaseline is liberally applied all over the face. That includes eyebrows! Plaster strips – think the kind that are used if you break your arm – are cut, dipped in warm water and applied to the face. Start with the forehead, go down the cheeks, across the nose and right over closed lips! Two or three layers should do it! The plaster will harden quickly so work fast. When all the layers are in place, gently loosen the mask and it slides right off. This is ambitious to say the least! Can’t wait for part 2!! !